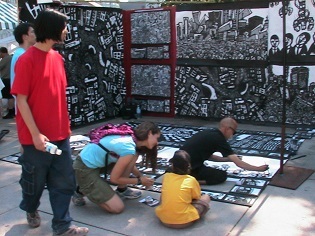 Outdoor Art Display in Public Exhibitions and Street Festivals. Presenting the HEY APATHY! artwork and performances at busy public venues has become one of the most exciting and inspiring aspects of my artistic investigations. 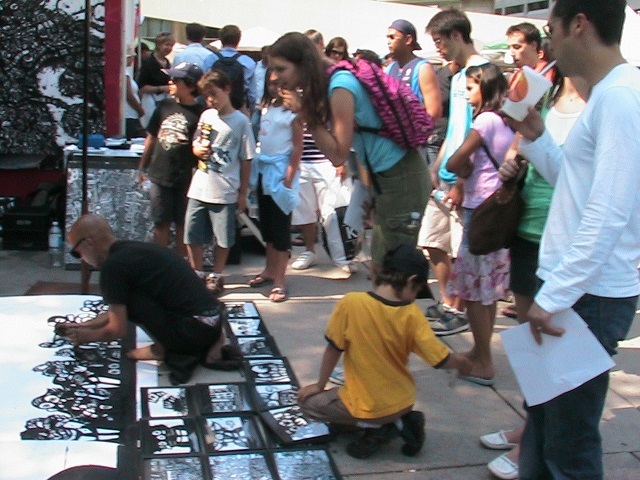 I started showing the work as a student at the Toronto Outdoor Art Exhibition 2002. I was amazed by the huge and diverse audience the open air exhibition attracted. It was unlike anything I'd ever experienced in a gallery as I found myself meeting people from all over the world and of all walls of life. 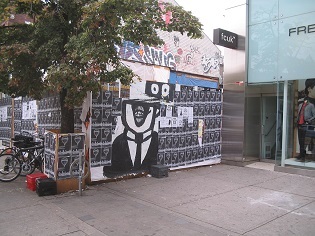 Inspired by this event I dedicated my practice to outdoor venues and developed several different displays ranging from minimal street art interventions up to a 10 x 20 ft portable gallery installation. 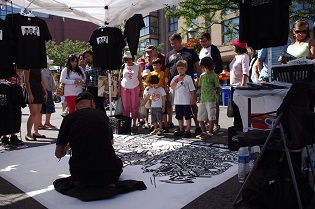 Since 2002 I have participated in over 25 juried outdoor events including the T.O.A.E., Nuit Blanche, the Ottawa New Arts Festival, and Busker'sfest as well as working as a full time Street Art Performer between 2004-08. 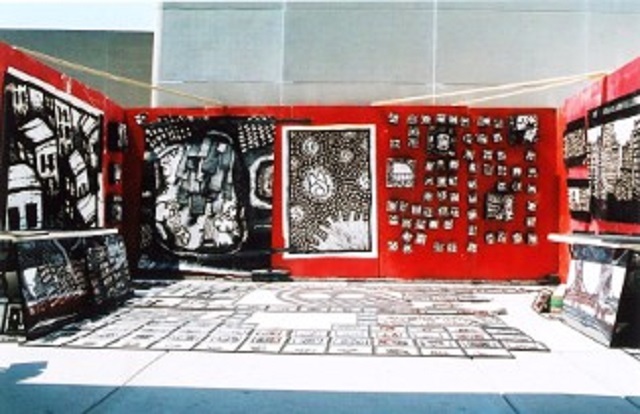 The most exciting outdoor art display that I have used was my giant 10 x 20 foot portable art gallery. This massive unit was made up of nine 4 x 8 ft and two 2 x 8 ft plywood panels which locked together using beams and pole along the back. This paneling permitted me to change the size and angles of the exhibit which was useful as different festivals allocate different dimensions for the exhibition space. 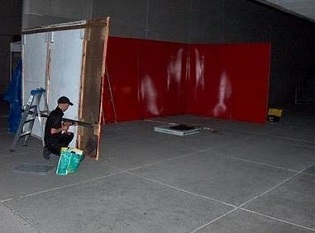 I painted this entire outdoor art display red in order to optimize the expressive nature of my work (a technique I have done several times inside art galleries as well). 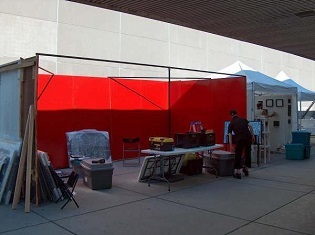 The giant red room really allowed me to take over the outdoor area recreating an imaginary and memorable experience unlike any traditional tent or easel display. 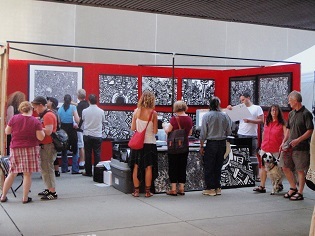 I used the interior floor space to exhibit prints on tables and do live painting performances at the busier festivals. The impact of this set-up was really exciting. I had some of my most satisfying exhibitions using the red wall gallery however there were drawbacks to the massive outdoor art display. First of all the walls took 2-3 hours to unload and assemble which can be very tiring prior to a three or four day event. The second issue was the tarp covering. I used poles and a heavy plastic to cover the unit when necessary but it was generally troublesome to cover such a large area when compared to using a pop tent. The display also required a fairly level ground to be safe and securely set up which is not something every outdoor venue provides. Despite these troubles the display was still an amazing way to exhibit the work and I used it for seven years and over 15 events (indoors and outdoors) before switching to the tent. Although the traditional tent display doesn't have the same impact as the portable gallery it became very useful as I started travelling and doing more frequent public exhibitions. The pop tent is very compact and takes less than 20 minutes to unload and assemble. 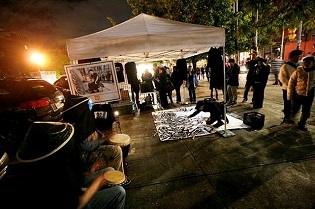 The first time I used the tent during a street art performance on Queen St. West as a part of Toronto's Nuit Blanche festival. Nuit Blanche is a one night only extravaganza feature all night art exhibits all through out the city. For my part in the event I set up two 10 x 10 foot tents. 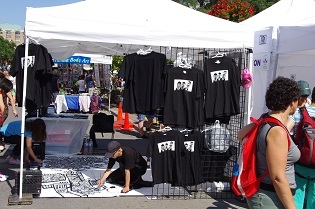 Under the first tent I showed a large selection of prints, t-shirts and paintings while the second tent housed a giant live painting demonstration with video projections and music. I use a set of light weight metal grids to hang the artwork on and do the live painting directly on the ground. To power the multimedia components and lighting we used a basic gas powered generator which we hid at the behind the tent. For regular events I usually use a single 10 x 10 foot tent with the grid displays which is really simple but easy to set up and effective. The tents are great because they protect from the weather, are easy to transport and assemble and can be set up almost anywhere. In addition to the larger events like the T.O.A.E. and Nuit Blanche I also did a lot of street art interventions. 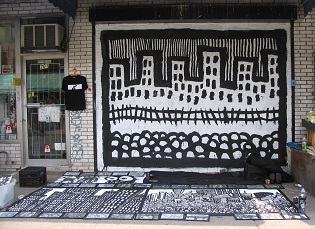 In these instances I set up the artwork directly on the sidewalk in busy downtown locations. Although I did this at various capacities ranging from really small all the way up to a massive display the basic set up was always the same. 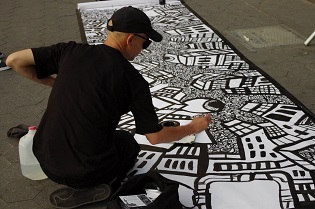 I would use black tape to mat a piece of white paper to the sidewalk for performance painting (ranging anywhere from 2 x 3 ft all the way up to 20 x 20 ft.). I displayed a selection of small framed prints around the edges of the blank paper with milk crates full at each corner.